When a group as diverse as the Internet's founding architects, security experts, legal scholars, major tech companies, MoveOn, The Tea Party Patriots, a host of video game companies, and millions of citizens come out in opposition of an idea, you can be certain something interesting is happening. 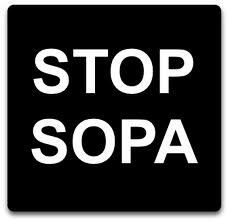 Like the other opponents of SOPA/PIPA, Jorge and I stand for an open Internet, free from the draconian policies big media companies wish to implement. Simply put, the kind of copyright laws SOPA supporters (which include companies like CBS and Viacom and organizations like the MPAA and the game industry's own ESA) seek would make it very hard, if not impossible, to foster the kind of creative space we have carved out here at Experience Points. Government-endorsed censorship, blacklists, and monopolies have no place in the video game sphere, on the Internet, or any in any other realm of human culture and society. We know how busy everyone is and how daunting such a huge task can feel, but anything you can do to resist this threat would make a difference. Google, the Electronic Frontier Foundation, and Ars Technica all offer good starting points for contributing to the cause. Speaking out on these issues, petitioning your government representatives, and supporting independent media are crucial steps to take. Whether you live in the U.S. or are one of our many international friends, this issue effects you. Whether you do so with your voice, your political support, or your wallet, please oppose the forces that lead to this type of legislation. Again, we know it seems overwhelming, but we can do it. In the face of today's protests, you can see SOPA's proponents getting worried. Shrill rhetoric is often a sign of desperation. I know we need to protect our rights to free speech. If this passes even mentioning the words of a video game character could mean litigation by that parent company. I already wrote my congressman in my district so that means I'm watching you Jim Moran!